Fremont, CA (July 19, 2010) - ASUS launches the VG236H—a new 23” Full HD 1080p display that includes market-leading NVIDIA® 3D Vision™ and Trace Free II technologies. The VG236H features a 2ms (gray-to-gray) response time and 120Hz refresh rate to deliver ultra-smooth 3D visuals in Full HD. ASUS’ Color Shine technology featuring a 400-nit brightness capability lets users enjoy vibrant colors while ergonomically-designed features like swivel, tilt angle, and height adjustments ensure viewing comfort even after prolonged periods of use. 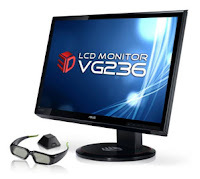 The VG236H features YPbPr, Dual-Link DVI and HDMI input ports to ensure a wide variety connectivity options. ASUS’ VG236H is the ideal monitor to experience the internet, Blu-ray movies, and games in 3D. The 23” ASUS VG236H monitor includes a NVIDIA® 3D Vision kit*, which features a pair of active shutter glasses with alternate-frame sequencing technology that immerses users in their favorite 3D movie or gaming world. There are currently hundreds of NVIDIA® 3D Vision compatible PC game titles** available on the market to enjoy along with exciting new title releases coming shortly. The ASUS-exclusive Trace Free II technology combines a 120Hz refresh rate with a 2ms (gray-to-gray) response time that effectively eliminates ghosting to ensure a smooth gaming and movie experience. ASUS Color Shine technology with 400-nit brightness provides brilliant and vibrant display colors in any application or movie. Color Shine technology uses multiple-color film layers instead of a single-film layer that reduces the diffusion of light allowing improved image clarity while at the same time enriching color density and saturation. To ensure user comfort the VG236H is easily adjustable to cater to almost any viewing angle. It can adjust swivel 150-degrees, height by 100mm, and tilt viewing angle. The VG236H provides a built-in cable management feature that helps conceal wires for clutter-free desktops. *For NVIDIA® 3D Vision™ system requirements, please visit http://www.nvidia.com/object/3d-vision-about.html. **For a list of supported games, please visit http://www.nvidia.com/object/3d-vision-3d-games.html. Specifications are subject to change without prior notice. Please visit usa.asus.com for additional information. The ASUS VG236H with NVIDIA 3D Vision kit will be available shortly at leading resellers and system partners with a suggested MSRP of $499. The ASUS VG236H without NVIDIA’s 3D Vision kit will be available in the near future. ASUS, the world’s top 3 consumer notebook vendor and the maker of the world’s best selling and most award winning motherboards, is a leading enterprise in the new digital era. ASUS designs and manufactures products that perfectly meet the needs of today's digital home, office and person, with a broad portfolio that includes motherboards, graphics cards, displays, desktop PCs, notebooks, netbooks, servers, multimedia, wireless solutions, networking devices and mobile phones. Driven by innovation and committed to quality, ASUS won 3,268 awards in 2009, and is widely credited with revolutionizing the PC industry with the Eee PC™. With a global staff of more than ten thousand people and a world-class R&D team of 3,000 engineers, the company's revenue for 2009 was US$7.5 billion. ASUS has been listed in BusinessWeek's InfoTech 100 for 12 years.